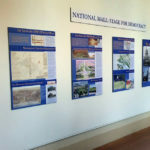 Called to the Mall is an anthology of original essays and graphics about the National Mall in Washington, D.C. by Washington area public school students and adults. Test your knowledge with these 17 questions about the cherry blossoms and the springtime festival held on the National Mall in Washington, D.C. every year. The National Mall is the Stage for American Democracy. It’s in need of a new plan and vision for the 3rd Century. Learn more by exploring our website to better understand the legacy of the visionary 1791 L’Enfant and 1902 McMillan plans, as well as the challenges we face and innovative ways we can solve them. On the National Mall we celebrate who we are as Americans, our nation’s founding ideals, and our civic responsibility to understand and champion the principles that sustain our democracy. Yet over the past decade, we’ve increasingly seen the visionary plans that created this iconic space trampled, the public’s use restricted, and hopes for a resilient future denied by inadequate planning. The National Mall Coalition is dedicated to reversing this trend through historical education, programming for the people, and cultivating ideas that will ensure the Mall’s vitality for future generations. We advocate for a new comprehensive plan for the National Mall, the stage for our democracy, in its 3rd century — the 3rd Century Mall. Why do we need to advance the legacy with a 3rd Century Mall? Why do we need to update public policy and unify governance? Why do we need innovative ideas such as the National Mall Underground?